Originally a woolshed it has been converted with a modern contemporary feel inside while retaining its original façade outside. Particularly spacious, there are two luxurious bedrooms and a stunning mezzanine floor all while enjoying the warmth of a cosy woodburner fire. Situated in the picturesque Dry River Valley, The Woolshed is a relaxing getaway - combining the elegant touches of the stylish decor and the peace and beauty of surrounding countryside. Offering the best of both worlds, just around a country corner are two popular vineyard cafe/restaurants. A uniquely serene and tranquil retreat with the feeling of being a world away yet less than 10 minutes drive to the Martinborough village. It offers a full scale kitchen, bathroom, laundry and large private outdoor living with uninterrupted views down the spectacular valley and an outside bath heated by an open fire beneath or running hot water. The valley offers peace - PLEASE NOTE that there is no cellphone coverage. Please note we have a minimum 2 night booking on the weekends and minimum booking requirements over holiday periods. Extra people are $50 per night. Lovely peaceful location. Perfect for a relaxing get away! Clean and tidy. Was cosey having the fire. Jenny was very helpful and pleasant. We would love to stay again! A wonderfully renovated woolshed that retains a lot of character without sacrificing comfort. Very comfortable beds and lovely furnishings. Plenty of garden space with outdoor seating and a bbq. Sadly it was too warm to try out the fire. We appreciated the “welcome pack” supplied. This holiday home has everything you could want in quiet surroundings but 10 mins from Martinborough. We would definitely stay again and highly recommend!! 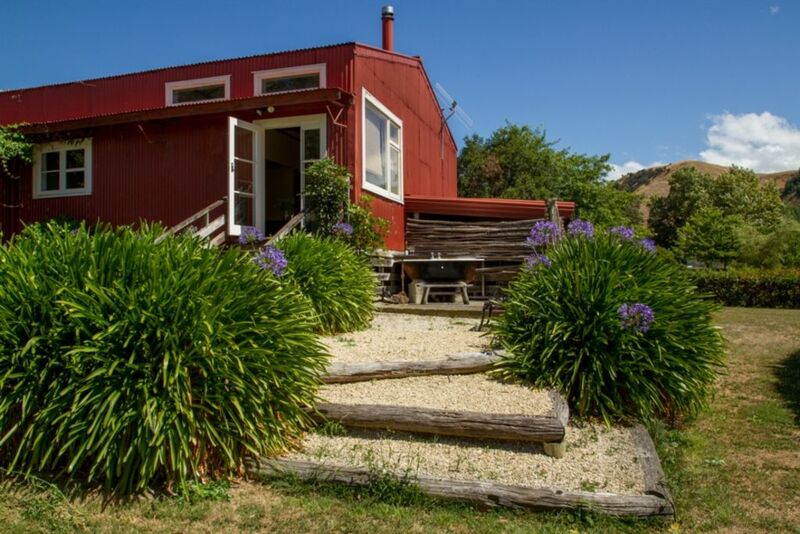 The Woolshed is in a beautiful quiet location minutes from Martinborough. We found the cottage in immaculate condition and a wonderful welcome care package awaited us. The kitchen was nicely supplied with all the cooking pots and pans we might need and the cutting knives were actually sharp! All linens and towels were supplied as well as shampoo, conditioner and body wash. We have often found when renting that we first have to check out what is supplied with the rental and then find a local grocery to buy items we might need. Jenny has thought all of this through and all we needed to add for out stay was food. Highly recommend for location, privacy, quiet, beauty and comfort. A great place to use as a base for many day trips or just to hang out, relax, soak in the outdoor tub and entertain friends. It is a great place for a relaxing stay. A perfect environment for families.